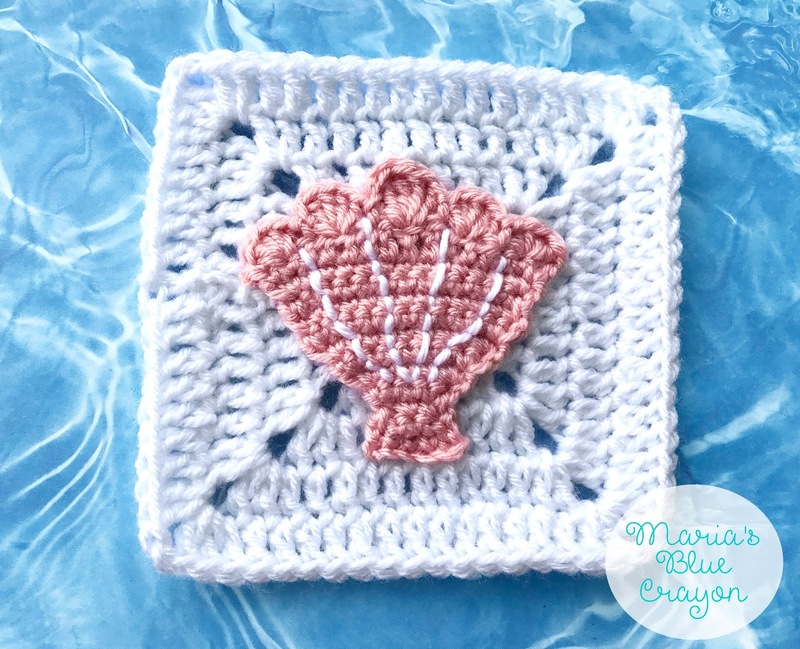 GET THE CROCHET SEASHELL APPLIQUE ALONG WITH THE GRANNY SQUARE PATTERN IN AN AD-FREE PDF DOWNLOAD HERE. OR SCROLL DOWN FOR THE FREE SEASHELL CROCHET PATTERN. The Seashell is the 9th square of my Ocean Afghan. To find all the information about this Afghan click here. You can’t have an Ocean theme without a pretty seashell! This 9th square is so pretty and will be my last one that I use so much pink on. 😉 I love this shade of pink from Lion Brand Vanna’s Choice – it gives a delicate sheen to it and is just so pretty! PIN IT TO YOUR CROCHET BOARD PINTEREST. Chain 13: Chain 1, skip first stitch, 5HDC (all in one stitch), slip stitch, skip stitch, 5 DC(all in one stitch), slip stitch, skip stitch, 5TR (all in one stitch), slip stitch, skip stitch, 5 DC (all in one stitch), slip stitch, skip stitch, 5 HDC (all in one stitch), slip stitch, fasten off. Using white yarn and tapestry needle, sew on details. You can also use the surface crochet method if preferred. I used the backstitch to sew on the details with a tapestry needle. (A quick youtube or google search will be able to show you this method of sewing if you’re not familiar with this technique). Enjoy your pretty seashell! You can find the granny square pattern here. Will there be a shark? I'm a scuba diver and love rays and sharks. Loving your squares and hoping to start this in August or September. Thank you so much for sharing your patterns! Yes! A shark is in the cards for this afghan! 🙂 I admire you for being a scuba diver – I can only hope I am brave enough one day to try it! In your pattern there is a row 12, but not 13. Instead it says chain 13. I imagine this is supposed to be Row 13? I am so tickled to find your blog. I'm looking forward to do this ocean afghan as well as the woodland one. Thanks for your hard work. Yes! It is suppose to day row 13 🙂 thank you for pointing that out – I will fix it!